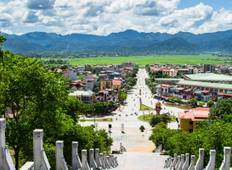 Find your tour through Dien Bien Phu and discover the best of Vietnam's Northwest on a mountain bike. Visit the local villages and learn more about the culture. Cycle over wooden bridges and along rice paddies to enjoy the most scenic views of the country. "Great tour, enjoyed our trip very much. Guide and driver are very much recommended!!"